The latest Premier League figures show that the Swans have spent more than £7m on agent fees in the past twelve months - part of an incredible £211m spend across the division as a whole as another group of people get rich on the back of the game. 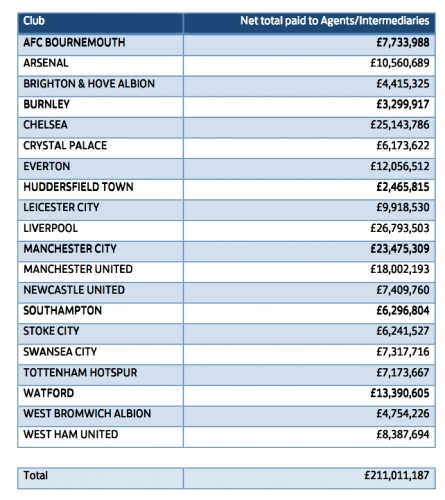 The Swans total was 12th highest in the Premier League and dwarfed by the £26m spent by Liverpool during the same period. Agents have long become an essential part of every transfer and in many occasions being the instigator of a move much more than the player ever is. Taking a chunk of the singing on fee has been the norm and it is far too often that transfer storied are leaked via agents to try and generate some interest in "their client"
But, as Mike Rigg, a former sporting director at Manchester City, QPR and Fulham, says: "If Fifa were to examine every breach, they'd have to investigate 99.9% of transfers. "In 30 years of football I have never, ever, met any person at any club who stands by Fifa's rules on tapping up." And the fact that nobody will even attempt to clamp down on it just shows the hold that players (and their agents) have over the game as a whole. Managers get sacked when players have decided they don't want to play for them and it is rare to see a club hold onto a player that wants out from the team. Or should that be when the agent wants them out? For a club with a turnover of approximately £120m then £7.3m is a massive chunk of that income and a big reason why transfer budgets at the Liberty are always so tight. Interestingly, Burnley's excellent record in the transfer market shows their spend at a little over £3m with over half the spend being attributed to the top six clubs who were a major factor in a big spending two transfer windows this year. Total spend in the Championship was just £42m highlighting the gulf in difference in finances between the top two divisions while Newport's total in League Two was just under £20k. The central midfielders are powerful and there to prevent the opposite team from playing; they conjointly drop terribly deep to safeguard the defense. The wingers are fast, with sensible crossing ability and also the strikers are hard-working.